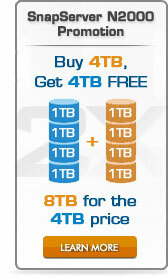 SnapServer N2000 Promotion - Buy 4TB and get 4TB FREE! Double your Capacity for FREE! Don't give up the features you need just for the price that fits your budget – you can have it all with Overland Storage's SnapServer N2000. The SnapServer N2000 is a feature rich, affordable, unified storage system that is ideal for businesses with increasingly complex storage environments. With a quad-core Intel processor, up to 6Gb Ethernet ports, and scalable to 144TB, the N2000 will keep pace with the most demanding workflows and applications. Fully compatible with Microsoft Active Directory, the entire set of 30 Windows permission attributes, and VSS/VDS for iSCSI volumes. For a limited time, purchase a SnapServer N2000 and we'll double your capacity for FREE! Q: What is the SnapServer® N2000 Double Your Capacity FREE Promotion? A: Purchase a SnapServer N2000 with 8TB of storage capacity at the 4TB price (this promotion offers a FREE upgrade from 4TB to 8TB). A: This promotion is effective from 12:01am PDT on October 3, 2011 until 11:59pm PDT on November 15, 2011. All orders must be placed by November 15, 2011. Q: What SnapServer systems are eligible for the promotion? OV-NAS101002 SnapServer N2000 8TB (4 x 2TB Enterprise Class) Promotion Config. Q: Is there any limit to the number of SnapServers that I can order with this promotion? A: No, there is no limit. However capacity upgrade is only available for the first 4-pack 2TB drive set per N2000 chassis purchased.